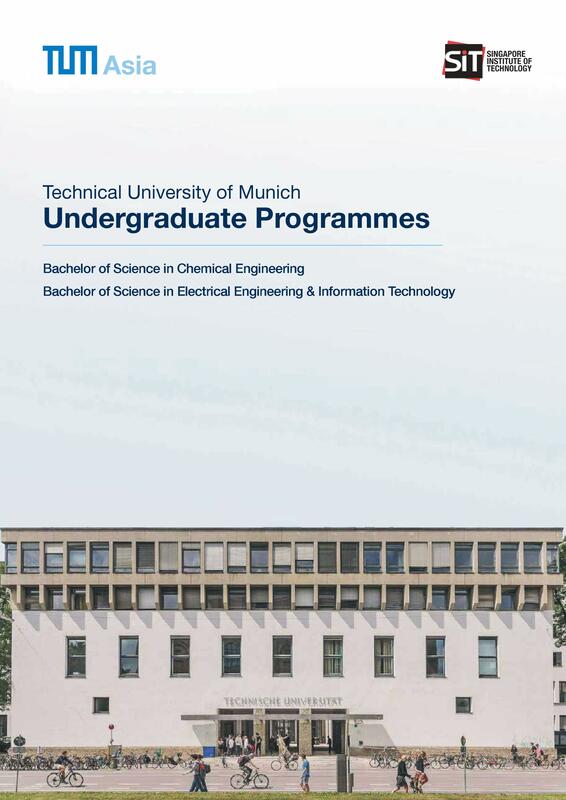 Blending Chemistry with Engineering knowledge, the Bachelor of Science in Chemical Engineering programme is conferred by the Technical University of Munich (TUM), offered in partnership with Singapore Institute of Technology. This degree programme is largely focused on industrial chemistry, dealing with more upstream processes of Chemical Engineering. Students will be exposed to the development and design of chemical processes. A strong focus is placed on the fundamentals of inorganic and organic chemistry to provide novel solutions to the petrochemical, pharmaceutical and environmental industries. For information on programme details, you may download the programme brochure below. Please take note that these brochures are for personal reference only, and should not be used for other purposes. All information is accurate to the time of publishing. Updated January 2019. NOTE: TO APPLY FOR THE TUM BACHELOR DEGREE PROGRAMMES, YOU ARE TO LOGIN TO THE APPLICATION PORTAL OF OUR PARTNER UNIVERSITY (SINGAPORE INSTITUTE OF TECHNOLOGY, SIT), AVAILABLE FROM JANUARY TO MARCH 2019. Applicants who hold the following Diplomas in their respective Polytechnics are eligible to apply for our programme (with an exemption package). Students with credit exemptions will complete a 2.5 year programme for the TUM Bachelor of Science degree. More information on credit exemptions can be found under Course Structure. Applicants who graduate with GCE ‘A’ Levels qualifications are eligible to apply for the Chemical Engineering degree programme. Students with other qualifications (completed a formal 12-year education equivalent to A-Levels) are eligible to apply as well. International students and GCE “A” Level holders will not be able to qualify for credit exemptions. Such students are required to complete the full 3 year programme for the TUM Bachelor of Science degrees. The teaching faculty in the programme is from TUM and SIT, with a majority of the core and advanced modules taught by TUM faculty who fly in to Singapore from Germany. All coursework are conducted in English and students will be taught by both German and Singaporean lecturers. Student-teacher ratio averages between 40:1 to 60:1, and Lab Course student-teacher ratio averages between 5:1 to 10:1. For articulated diploma holders: It will be a two-and-a-half (2.5) year degree programme, inclusive of four (4) semesters of coursework (for articulated diploma) and one (1) semester of Bachelor Thesis work (you can complete your Thesis in TUM’s home campus in Munich, Germany). For articulated diploma holders: It will be a three (3) year degree programme, inclusive of five (5) semesters of coursework (for articulated diploma) and one (1) semester of Bachelor Thesis work (you can complete your Thesis in TUM’s home campus in Munich, Germany). Students are awarded the degree upon a completion of 180 credits. A student will successfully complete his/her degree course in the n+3 year, n being the year of enrolment and assuming the circumstances that the student will not have any failed modules that he/she is required to retake. For example, if a student is enrolled in August 2017, he/she will complete the course in either March 2020 or August 2020, depending on whether it is the 2.5 or 3 year degree course. One of the many benefits of getting a TUM degree is the chance to visit Germany and experience learning in a different setting. As part of the Bachelor of Science programme, every undergraduate student will have the chance to study in Germany – to conduct their Bachelor Thesis in the home campus of TUM after they successfully complete their coursework. During the course of the Overseas Immersion Programme (OIP), each student will have the chance to study in Germany by being paired up with a TUM professor who will mentor them throughout their Bachelor Thesis research work. Seize this great opportunity to learn first-hand from experts in the field! Apart from having to complete the Bachelor Thesis, students will get to spend time outside of campus exploring, experiencing and immersing in German culture. Review of Mathematics; Units and Dimensions; 1D Kinematics; 2D Kinematics; Newton’s Laws; Work and Energy; Momentum; Rotation; Waves and Oscillations; Zeroth Law; Ideal Gas; Kinetic theory; Specific Heat; Thermodynamics – First Law. Introductory and Summary of Thermodynamics; State Functions; State Equation of an Ideal Gas; Force and Energy of Single Atoms and Molecules; The Degrees of Freedom of a Molecule and their Energetic Equilibrium; 1st Law of Thermodynamics – Work and Heat. What is a state function? State functions at constant pressure: Enthalpy, Real Gas – A System with Intermolecular Interactions; Entropy and the 2nd Law of Thermodynamics (Reversible – Irreversible Processes); Free Energy and Gibbs Free Enthalpy; The Gibbs Equation or fundamental thermodynamic relation; Multiple Component Systems – Equilibrium between Different Phases; Equilibrium of chemical reactions. The tuition fees listed is cited from the Singapore Institute of Technology website. SIT manages the financial portion of the Bachelor of Science programmes that TUM Asia conducts. For more information, please visit: http://www.singaporetech.edu.sg/tuition-fees-grants.